Those involved with Nightwish have to be some equally creative and passionate folks. The band finally takes a little bit of a break last year, and suddenly a number of new releases that they have been holding onto start popping up out of the wood work (such as Auri). 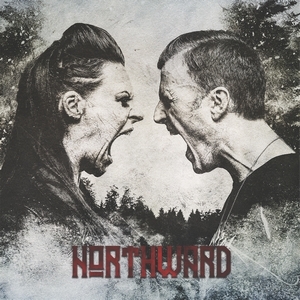 The latest of these is the teaming up of Nighwish vocalist Floor Jansen and Pagan’s Mind guitarist Jørn Viggo Lofstad in Northward. While the act is more of a hard-rock one than fully metallic, there’s no arguing that it’s a solid piece of music that should appeal to fans of either parties involved. Northward was originally brought to life a decade ago, but due to scheduling purposes, the material had been sat on for quite some time. But when it has a timeless quality like Northward, the results speak for themselves. A bit of arena rock in the ‘80s style with nods to the ‘70s as well as more modern material results in something that never fails to deliver hooks, either from the vocal lines of Jansen or Lofstad’s riffing. There’s a wide variety in tempos, from all out rockers like “While Love Died” and “Let Me Out” to more gentle cuts like “Paragon” and “Bridle Passion” to ensure things stay fresh over the course of the 50-minute album. Thicker guitar lines on songs like “Big Boy,” which swings between crunchy and danceable, and “Drifting Islands,” where thunderous riffs crank things up in between more melodic moments, allow the album to spread its wings even further. Jansen’s vocals provide the needed combination of beauty and power, with a song like “Timebomb” showcasing both sides of this equation as the track slowly builds itself into heavier territory. There’s not a track in the mix that doesn’t bore it’s way into your head for a while, which is probably the strongest compliment the album can get, particularly one of this style. With the members involved, it’s doubtful that Northward will become massively prolific, but there’s hope that it becomes more than a one-off thing. Extraordinarily catchy and filled to the brim with hooks, it’s simply a well-made record by some top tier musicians that allow them to stretch the boundaries from their usual gigs.